You don’t generally see so many of the American editions of budget label Pickwick albums in the UK (given their low retail price there would hardly be much incentive to import these back in the seventies), so I was interested to find these two lurking in a charity store a little while back. 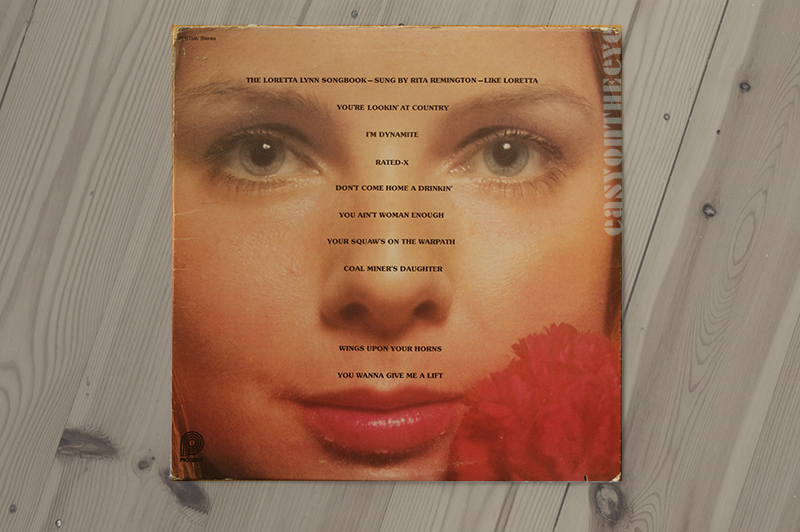 The Loretta Lynn Songbook goes for the ‘pretty woman on the cover’ ploy, a feature (as we know on this site) of many budget albums, but uses a cropped close up of her face, which is actually quite striking. They then rather spoil the impact by running the song titles down the centre of her face. As the album title is in the same typeface it becomes difficult to read at first glance. Further down the cover the layout artist clearly got worried that the last two song-titles might not show up on a darker part of the photograph (as if that might somehow impact on sales!) and so hangs the last two titles well below the rest. You can still hear the creative cogs whirring away four decades later. All that effort and then the sleeve is so sloppily manufactured that the album spine text ends up being printed on the back instead. Although the striped Pickwick logo appears on the front, the album label is Hilltop Records, one of the Pickwick imprints, issued in 1974. 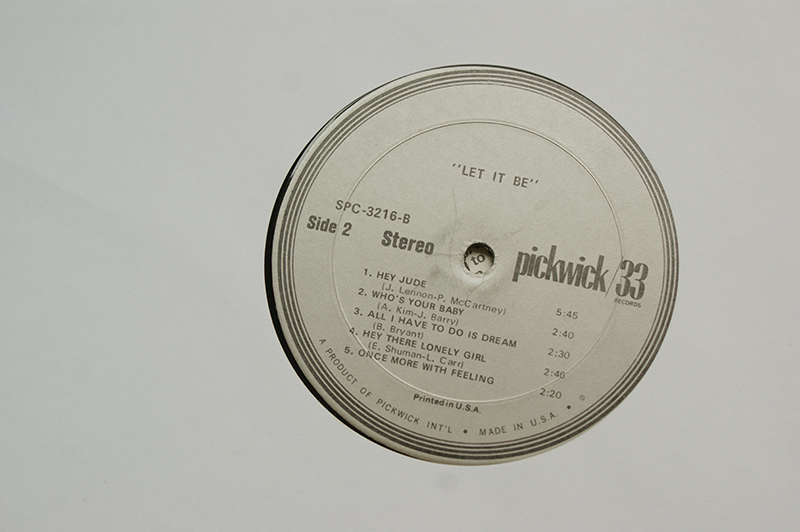 On the regular silver and black Pickwick label (shown below) comes the second album, titled Let It Be / Hey Jude and Other Heavy Hits. No date is given but both The Beatles and Archies hits suggest around 1970. It is one of the label’s many chart hit covers compilations, though the only hint that these are not the originals comes buried away in the lengthy liner notes (which give a potted and skewed history of rock and pop): “Kings Road perform each selection in a fresh musical light without a shade of doubtful form.” Indeed. That said, the cover really stood out for me, which is why I picked it up. A smart mix of found images and mixed up decorative type, all in pale colour tints on a white background. It makes you wonder where they sourced this material, although books of copyright free vintage graphics were certainly available to the design trade (and similar libraries are still to be had on the web), and they might have had some sort of early headline photo setter for the snazzy fonts. The graphics are tied in to the song-titles too, so Rainy Night In Georgia gets a Victorian gent holding an umbrella, placed over a map of the state. 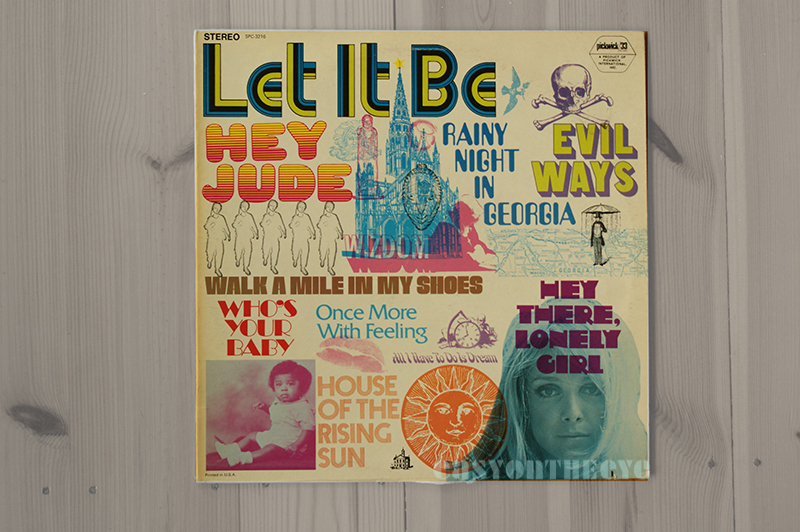 Let It Be is given particular emphasis, to cash in on The Beatles’ final album and hit single, but it’s quite mixed collection when you look more closely – Santana rubbing shoulders with The Everly Brothers – and quite short, something like 15 minutes a side.